E.T. : off the planet, into a carrier, and off for vital surgery ..
A cat so feral and ‘off the planet’ she was named E.T, this week went meekly into a carrier for vital surgery – thanks to her carer, Walsall Road allotments secretary Betty Farruggia. Oh, and a nice tasty morsel chucked in the back of the basket as bait! E.T, who was taken in by CP several years ago after being born on the allotments, was never going to be a friendly feline. Luckily, after being spayed, she was kindly offered an outdoor placement with the rest of the community cats at Walsall Road allotments. Secretary says the plot-holders are grateful to the cats for keeping the vermin down. And so a whil ago they clubbed together to set up a vet fund so that if the cats needed vet treatment, they got it. E.T. pictured right - two days after his surgery to remove cancerous growths from his ears. Betty explains how ET has come to use up practically all the kitty in the vet fund – over £500! 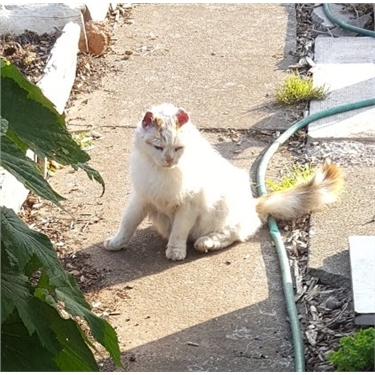 “E.T, one of our Walsall Road Allotment community cats, has had an operation to remove cancerous growths from her ears. "Most of both her ears have been cut off. I only noticed the cancer because our CP and allotments friend, Jenny Reynolds, asked if Craig's ears (a scruffy white cat who visits my garden) were alright. White cats can get cancer on their ears. So this prompted me to take photos of E.T. – who I was also worried about. The photos were enlarged and we realised that – yes – it looked like ET had cancer. "So a vet appointment was booked – but I was REALLY worried about how I would get her into the cat-carrier. Although she comes to me for a fuss and lets me stroke her, I'd never picked her up. And certainly no-one else could get near her. I’m really a ‘cat novice’ and couldn’t sleep the night before her op with worry. "But Jenny advised a tasty meaty morsel would do the trick, and we popped that in the far end of the carrier. Well - she surprised us all by strolling in after it as good as gold! Jenny Reynolds confirms that not only did E.T. have around two-thirds of each ear removed, but while under it seemed a good idea to smarten her up with some dental work and flea treatment. “As Betty says, she is far from a friendly soul, but loves her life on the allotments. And not just her life – her love-life too! She has one good cat mate – Wanda – who welcomed her back on site with a nose nuzzle and a cat kiss. Bliss for us to know CP and others – like Betty - are doing such a good job for these community cats." * See more photos and what Betty says on the Facebook page ‘Robert the Allotment Cat’ and follow E.T’s progress. CP wishes E.T. a swift recovery. ** CP often has cats that need outdoor placements – farms, stables, hotels, allotments. If you can offer such a placement, and would like 2 or 3 cats to keep the vermin down, get in touch with Cats Protection North Birmingham via the helpline.